Shopping for Star Trek Barware? Share your love for adult beverages with the Star Trek Bottle Opener Gift Set. Two USS Enterprise bottle openers and a Klingon Bird of Prey corkscrew. A must have for any fan of Star Trek! If you're a Star Trek fan, don't beam into a hazardous party situation without the Star Trek Bottle Opener Gift Set! 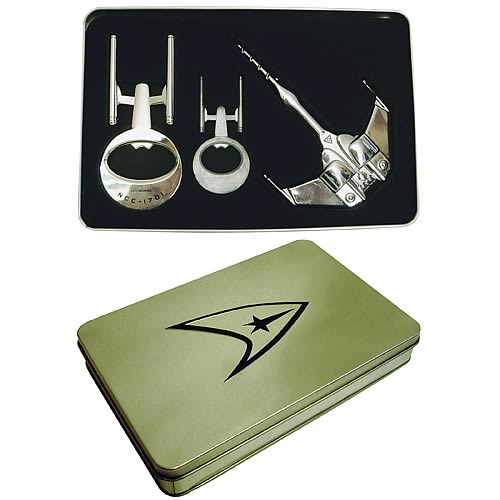 This stellar pack comes with three essential party pieces, all packaged in a collectible tin: two bottle openers (in different sizes) featuring the classic lines of the starship Enterprise, and a Klingon Bird of Prey corkscrew. The tin measures 9-inches long x 6-inches wide x 1 1/4-inches tall.